Efo riro is a very easy and common dish around Nigeria, mostly Yoruba people eat this dish. People have many different ways of making their efo riro. Any way you make it will still taste delicious, but I personally love to make it this way. follow my steps below for a quick and easy Efo Riro dish! You can find the following ingredients in any local Nigerian store/market. Step 1 – Add your chicken/beef/goat meat to a large pot with water and 2 or 3 maggie stock cubes and a little salt. Allow to cook for 30 to 40 minutes. Step 2 – Get a large pot or pan and add 3 table spoons of Palm oil. Now chop 1 onion into very small pieces along with your scotch bonnet, add the seeds too if you like it spicy!. Add your onion and chili to the oil and allow to fry for 5 minutes. Step 3 – Now blend all you tomatoes/ chopped tomatoes together and add to your oil with 2/3 table spoons of Efo seasoning and 1 table spoon of chili powder (optional) and allow to cook for a further 5 minutes. Then wash your spinach through out. 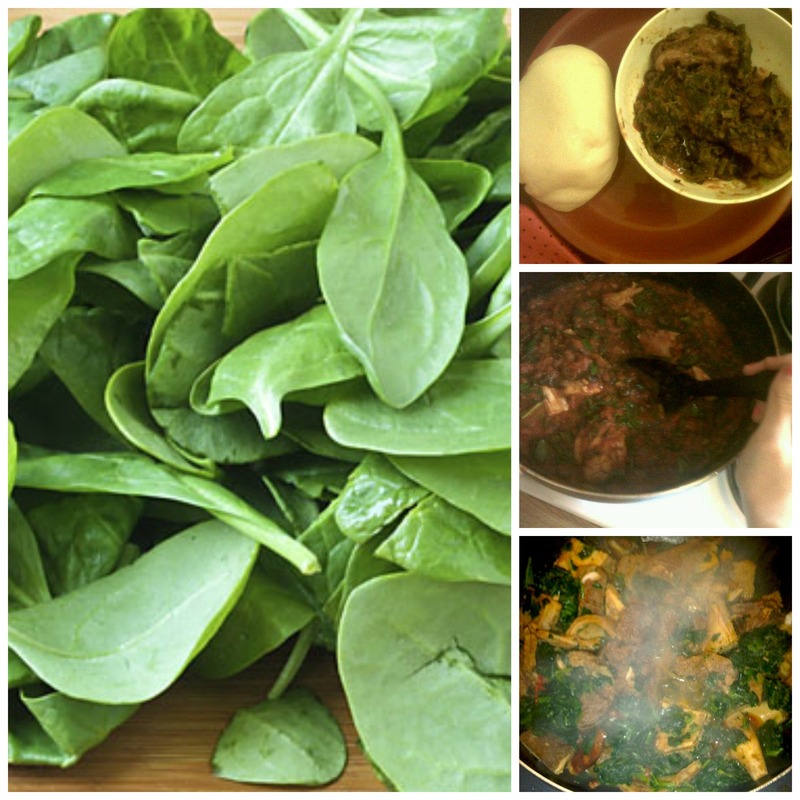 Chop your spinach up and wash again. Now add your spinach and cover the pot and allow to steam/cook for 15 minutes. (some people cook for 5 minuets but i personal like it well cooked as does my Yoruba Boyfriend) Add your chicken/meat to the soup when your chicken/meat is cooked through out. Step 4 – Prepare your yam! Cut and dice your yam before preparing the soup, then boiled your yam in a pot. When your yam is cooked and soft (you can check if it is ready by stabbing it with a fork to check if it is soft) put your yam pieces into you pestle and begin pounding. Pound all the large peaces first and then pounded all the lumps out of it. (this can be tiring) hehe. Add water little by little to get the right texture. Its best to use the water you cooked your yam in as it has more starch! Powdered Yam- Simply boil water, about 2 cups, in a pot and add the yam powder and mix through out, try to mix fast and press against the side of the pot to remove any lumps. Rap your yam in clingfilm to keep its shape and heat if you are not going to eat it right away. 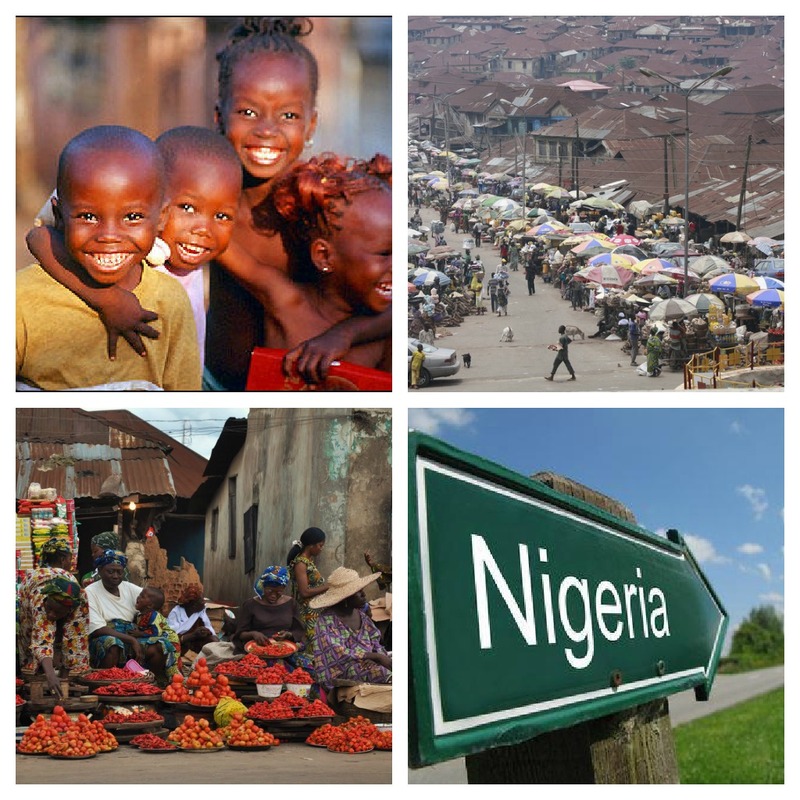 Why would you want to settle in Nigeria? I have been asked this question by almost all of my Nigerian friends and even some of my British friends. So my post for today is to show people why i want to settle in Nigeria one day. First thing i have to say is, British culture (if there really is one) is not my thing, don’t get me wrong, Britain isn’t the worst place on earth or something, but i feel i am more suited in Nigeria. I love my country but i feel like i am not “fitting in” I’m from Scotland but currently living in England and i feel very bored and don’t know anyone who shares the same interests as i do. Most British people go clubbing, go drinking, and all those things, where as i dont. Yes, there is people in every country who go clubbing and all that, But it is very common in Britain. I don’t really care if people judge me or say i don’t like my country and all that rubbish, because i know my reasons for saying all this and it certainly isnt because i hate my country. I am simply following what i love! I like to wear Nigeria clothes or clothes from different parts of Africa, But when in the UK its not possible to wear a traditional Nigerian dress or something, it is simply too cold for starters lol. When i tell people i want to move to Nigeria they say “are you crazy?” well no, im not. I simply like different culture from others and thats it. What most people see as “crap” i see as amazing. Most Nigerian want to run from their country because the lack of supplies etc Like the electricity for one is not constant and there government is obviously not doing their job correct! And yes, Nigeria need alot of help to make their country a better place, but i am not going to Nigeria for a glamorous life! I wouldnt even move out of the UK if i was looking for a easier life. The UK isnt all perfect and easy but of course we all know it has more help than Nigeria, But GOSH it is expensive to live here! I have had this “dream” since i was a kid that i will move to Africa and do all the things i have dreamed of. It will defiantly come true because i am already half way there. First think people should know is, if you want to settle in Africa then it will take years to prepare for that. You need money and to get money u need to work hard! I have been working and doing all i can to get money together so i can finally go to Nigeria and hopefully build a house and settle down. Something else that makes me eager to move to Nigeria is the people i know there. I have met the most wonderful people from Nigeria. Who ever says Nigerians are not good people are liars! yes there not all perfect but there is soooooooo many wonderful people from Nigeria. I also have people in Nigeria who will be my family one day, and i cannot wait to be able to live around them and see them any time i want. My Nigerian friends make me feel really really loved seriously! It just cant wait to be around those people who really care about me and treat me so well. I want to be able to wake up and think “wow so i am in Africa” hehe i want to feel that every day! I am ready to face any struggles it may take to live in Nigeria and i am not stupid to say it is going to be easy, because it is not Going to be easy but it going to be worth it! I want to be able to wake up and really work hard to gain things in life. I also want to be able to just go out to the market and be surrounded with great people and great culture! to be able to go for some rice from the market and see Nigerians in their Head wraps and Nigerian dress. and to see mothers carrying their babies on there backs. I also want to be able to use what i have learned to get along with my neighbors and others around the village. I want to settle in Ibadan because i have learned a lot about the culture there. I am not a city girl AT ALL so living in Lagos is not really for me. 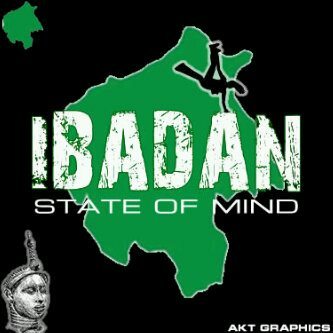 I dont have a problem with Lagos but i have my mind set on Ibadan. I just cant wait to join my wonderful friends and family to be in Nigeria. It will surely be a dream come true for me. To be able to eat pounded yam with them and gist each other in Yoruba hehe and to be able to go and hang out with my wonderful family to be. I also have this plan in mind to study the Yoruba culture in Nigeria. That may be later on when i have the funds to do so. Another thing i have dreamed of doing is setting up my own center/cafe where i can cook and serve people Nigerian foods. Also i want to do a lot of volunteer work and try my best to help people. I want to also look for a place where i can go and help Young kid speak Yoruba or English, which ever they need help in. Anyways i better stop talking because i could go on for hours lol I have soo much dreams that i know are going to come true because it is all down to ME to make them come true.